POSTED BY Vishnu Kumar ON 29-Jan-2019. Your knowledge of Ladakh is restricted only to the sweeping valleys, towering snow-clad mountains, ageless forests and greatest monasteries. But, have you ever ponder your imaginary mind; apart from its lip-smacking Ladakh food and riding the bike on the highest motorable road and highest mountain pass, what else makes Ladakh so favourite amongst the backpackers? Well, don’t just think, read this post till the end and you’ll come to know what makes Ladakh so important to visit? Ladakh is imbued with festivals, rituals, traditions, culture and heaps of local things that many backpackers enjoy to do in Ladakh. 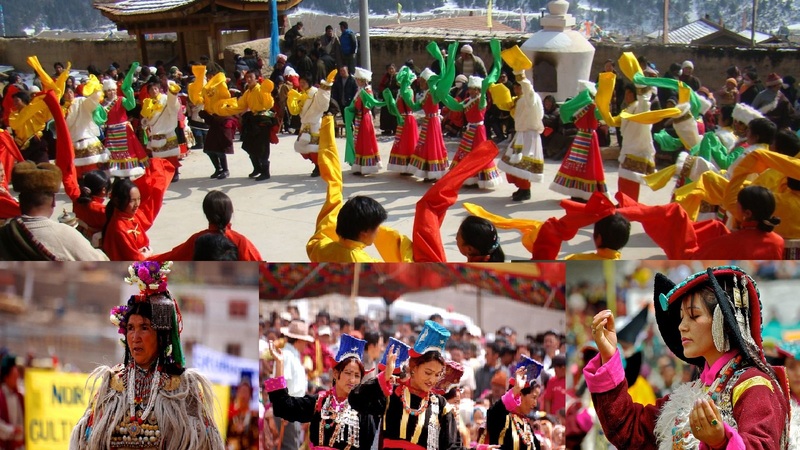 Festivals in Ladakh provides an authentic way to see the real Ladakh. So, if you’re contemplating what to do in Ladakh on your Ladakh tour package, celebrate any of these 5 Festivals in Ladakh to enjoy the life in the roaring town of Ladakh. Losar is the most celebrated festival in Ladakh which locals celebrate to mark the inception of the New Year. Though, you’re not fortunate enough to indulge in this festival this year as the New Year has passed, but you sure need to keep in mind that during the Losar Festival, locals of Ladakh get their devotion fixed by lightning the holy fire, whispering the mantras and exchanging cultural values by organizing cultural events as well as local events. If you want to connect your soul with the real Ladakh, we're sure, you would tick this festival in the upcoming year. Don’t you? If you fancy yourself a culture vulture freak, then Stok Guru Tsechu, which is one of the masked festivals of Ladakh is for you! Asa celebration of custom at Stok Monastery, the festival starts on a ninth day after the inception of the Tibetian New Year. There are impressive showcases of traditional dance, rituals, music and food. The blend of local humans at this festival is the highlight of this vibrant festival. The locals of Ladakh are deeply rooted in their customs, rituals and traditions. That is why at Matho Nagrang Festival, they dress up just to resemble the way Ladakhi God and Goddess used to dress. This festival takes place for 2 days in a row and is charmingly famous amongst tourists as the locals used to celebrate the return of two priests or you can say oracles after spending a month in the most mindful therapy - Meditation. You should fell the thrill of mask dance and silk robes by the locals. Touted by the most well-known festival of Ladakh, Hemis festival is celebrated through the local humans in complete spirit. This pomp is widely known within the name of Padmasambhava, the founding father of Tibet Tantric Buddhism. That’s why it's miles celebrated for two days inside the Tibetan lunar month. The festival is the epitome of the Buddhist tradition and will provide you with the feeling of fulfilment. In case you need to get the little bit of home form of feeling, be a part of this festival which is celebrated at the largest Buddhist monastery in Ladakh - Hemis Gompa. Tip: The famous Chham dance and devil dance is the treat you should intake on your Leh Ladakh Tour Packages. The Chemrey Angchok festival of Ladakh takes stretch each year within the month of November from twenty eighth-twenty ninths. The visitors come to Chemrey to witness the wealthy way of existence of Ladakhi people. The pageant is an amalgamation of theatre overall performance and song concert underneath the supervision of Lamas and locals. The songs commonly talk approximately various subjects, such as love sentiments, greetings or even only a few goal things. Historically, the last carnival of Chemrey is going thru the bustling marketplace of Leh wherein masked dancers chant and celebrate the victory of truth over the colossal. So, plan your Ladakh tour package according to any of these festivals in Ladakh. Trust us, you’ll love to lose yourself in the festival spirit of Ladakh.